George Vradenburg is Chair of the Global Alzheimer’s Platform Foundation, which he initiated in 2013. 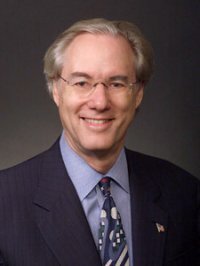 George was named by U.S. Health and Human Services Secretary Kathleen Sebelius to serve as a founding member of the Advisory Council on Research, Care, and Services established by the National Alzheimer’s Project Act and has testified before Congress about the global Alzheimer’s pandemic. He is also a member of the World Dementia Council, appointed by UK Prime Minister David Cameron. George is a co-founder of USAgainstAlzheimer’s and UsAgainstAlzheimer’s PAC, convenes the Global CEO Initiative on Alzheimer’s Disease and co-convenes Leaders Engaged in Alzheimer’s Disease. He and his late wife, Trish, have long been dedicated members of Washington’s civic and philanthropic community. George served for 13 years as Chairman of the Board of The Phillips Collection, for 4 years as a Trustee of the University of the District of Columbia and is currently a member of the Council on Foreign Relations and The Economic Club of Washington. He has served in senior executive and legal positions at CBS, FOX and AOL/Time Warner. George graduated from Oberlin College, where he was elected to Phi Beta Kappa, and obtained his law degree from Harvard Law School.